But this is not about clothes! This is about 2 bigger purchases I made this weekend. I’ve been running with the MEC Meet-up Trail Group since late February in older road shoes that have, above average traction? This was fine when I started since the trails were covered in ice and snow I had to have icetrekkers on anyways (FABULOUS grips you should get them). And then the snow melted and the mud came. At first I was fairing okay in the mud, it was so deep and mucky your feet just got stuck in there. And then towards the end of the major mud things changed, it wasn’t as deep and was just more slick. More of a challenge especially on the up and downhills. So I was kind of like, man, I really need to get on picking up some trail shoes. So that was about a month and a half ago, I’m lazy. I actually went in to MEC one day a month ago after Race 1 when I had 10% off and tried a couple on but I was waiting to take a bike out for the test ride at the same time and they called me so I went to try the bike and then I was too lazy to keep trying on shoes. So I finally went this weekend, I went to Sail first to check out what they had and then though I’d go to MEC after if they didn’t have anything since I had 10% off again from Race 2. Didn’t need to go to MEC! Sail didn’t have a lot of options but they did have some Solomon Gore Tex ones, I was looking more for waterproof ones since I don’t see needing to replace my trail shoes in under a year. I don’t put a ton of milage in on the trails and trails are easier on shoes anyways. So I wanted something that would keep my feet dry and warm in the snow. But, I did not like those shoes, the arch support was really far back and I could feel it on my heal. What they did have though was a pair of Asics on sale for $60! And I love Ascis, they’re my favourite road brand. I put them on and they felt instantly comfy, have decent traction and they were the last pair so no hesitation, I was buying these. They’re not waterproof but for less than half the price of a waterproof shoe, I’ll deal. I was fine not wearing waterproof shoes all winter, I had good socks, so, who cares. Second thing I bought also came from Sale and I’m so excited about this I’m laughing at myself for being so lame. I bought the Nathan Insanity Hydration Vest. My current hydration gear is less than ideal. I have a single bottle holder I don’t mind so much, but it’s only a 600ml bottle. 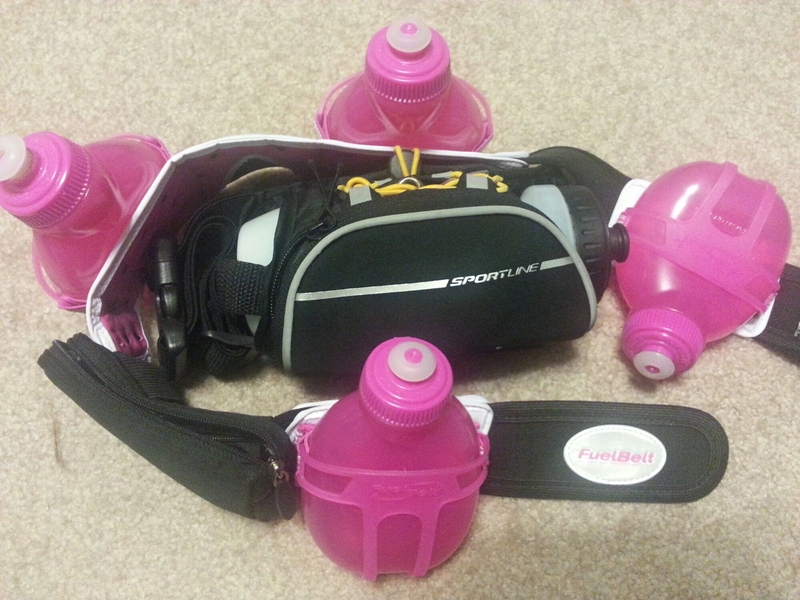 So for long runs I have a 4-bottle fuel belt. I don’t care if it is pink, they never put this thing on a women before designing it. This thing is horrible, it bounces and slides around. The first time I wore it I spent more time adjusting it trying to get it right then I did actually enjoying my run, at one point it even fell off. Yeah. During runs it would even twist to the side. And then what happens? Your arm hits the stupid bottle. The reason it’s so uncomfortable is because you have to wear it on your hips so your arms don’t hit the bottles… and then you arms sill hit the bottles. Disaster. I hate it so much. I haven’t even worn it very much since I got it near the end of my half training last fall. And pretty much avoided it at all costs during the winter. I took it out for my 2 longest runs training for my 30k (and only because I was transitioning from chews to gel and needed more water to get them down). But this was in the winter and with all the layers I actually didn’t notice it as much. Still, it’s heavy and it makes me angry. Going into my summer training I knew I’d rather pass out from dehydration than wear that damn thing all the time. I looked at getting one of the 3 bottle belts since they’re positioned at the back I thought I might be able to wear it on my waist or at least somewhere more comfortable but turns out they hold no more water than my single bottle holder. Also, the 900ml it holds would 0% chance get me through 3 hour August runs. Time for new solution. A couple women in my trail group wear the hydration vests so from listening to them talk and asking questions I learned a couple things so I knew what to look for. My biggest concern with the vests was heat, I sweat, a lot, especially my back. Wouldn’t the pack make you hotter? Apparently not. All good there. Another important question, does the water stay cold? YES it does. Pretty much sold right there. I love cold water, I hate drinking warm water, I refuse to drink hot water. So basically on the end of long runs I stop drinking water because it’s gross and only drink it when I absolutely need to. Super unsafe. But seriously, it’s so gross. And then I get cranky which is fine when you’re alone but my water went warm on a group run last week and I’d rather hide that side of myself, they don’t know me well enough. Also I don’t want to subject anyone to that. Through people talking I also learned there was such a thing as women specific vests. Well I though, I’m definitely going to need that. One girl has the Ultimate Direction Jenny pack, and while it is purple and pretty, I didn’t like the idea of having the bottles at the top. I knew my peripheral vision would get annoyed by that. I saw online MEC also carries another women’s vest the UltrAspire Astral Race vest but I didn’t really like how bulky it is in the front, did like that it already came with a bladder though. I was set to try them both on anyways just to see. But when I went to MEC Friday I found out they were sold out of both. So while at Sail I went to check out their selection. They had 2 women specific vests, one by Camelback that was made for mountain bikers so it was bulkier than what I wanted and not as comfy and then the Nathan Intensity Race Vest. It felt comfortable as soon as a put it on, comes with a 2L bladder and a pouch in front for another bottle which is perfect as I may need to consider bringing Nuun with me on my runs. I don’t particularly like drinking it while running but may need to out of necessity. One good thing about my FuelBelt, one of those bottles fits perfectly in the little pouch. I think you can actually put up to a 20oz bottle in that pouch but all I would bring is the flask probably. I liked what I saw with it, had some pockets on the front but they aren’t big a bulky looking and they’re lower down so they’re not in your face. I even checked, while I tight fit, the front even holds my Samsung GS3 with the case on. I don’t actually ever run with my phone, but now that I’ll have a place for it, I might. Although I might not put it in the front, it looks like that pocket is not sweat proof. But there is a pocket in the back I can put it separate from the water. What will also be good is I’ll be able to take sunscreen with me so I can reapply after I swear it all off. I’m pale and freckly, I burn. And I don’t want to have to plan routes that have me circle back to my car to put on more sunscreen. For now my only complaint with the vest is the colour. It only comes in red, and I’m sure some women prefer the less girly colour, but I’m not one of them. Like seriously, I bought the pink fuel belt. Sooo I wish the pack came in purple or pink, or blue, I’m not a fan of the red. Buuut I guess I’ll deal. Can’t wait to try it out to see how it feels on the run with water in it! I’ll do a full review of it after I’ve run with it a bit. For shorter runs I’m considering getting a palm holder and completely ditching the waist pack. I’ll probably stop in to the Running Room one day and see if I’m okay with the feel of it. While I don’t hate the waist pack it is pretty comfortable and relatively forgetful in a way, I’d prefer not to wear it.